The US Federal Reserve raises rates on 14 December 2016 for the first time in nearly a decade, and how does this affect Singapore SMEs? For one, cost of business loans are expected to creep up. There are several other ripple effects the Fed rates hikes might have on our SMEs which we’ll discuss below. Before that, why would US increase their federal fund rates after almost a decade and almost 8 years of extraordinary super low rates environment from 2008’s financial crisis? The 2008 global financial crisis, triggered by the defaults combustion of the US subprime mortgage sector, embroiled global financial markets into the worst crisis since the Great Depression of 1930s. The US Federal Reserve chairman Ben Bernanke then rolled out what was a controversial monetary policy of quantitative easing (QE), where money supply was increased drastically. The multiple rounds of QE from the US and later the central banks of some of the world’s developed economies flushed the global market with cheap money by lowering borrowing costs. This monetary policy was pursued to kick start the free falling economy by encouraging businesses to borrow for investment and consumers to increase spending. Global interest rates remain depressed from 2008 till 2016 as money supply flooded financial markets. This heralded the era of abnormally low interest rates. Some countries such as Sweden, Japan and Switzerland even experienced negative interest rates. This is an interesting situation where savers technically have to pay the bank interest to deposit their funds. Closer to home, our domestic benchmark interest rate SIBOR (Singapore Interbank Offered Rates) has largely moved in tandem with US rates. From the chart above, Sibor ticked up close to 1.2% by December 2015 as markets start to price in the expected rates hike from the US Fed. Citing an improvement in recent US economic and jobs growth, the current chair of the Fed Janet Yellen announced the widely expected increase in the Federal funds target range from historical lows of 0.25%-0.5% to the revised range of 0.5%-0.75%. If the Fed deems that jobs growth indicators are positive in the near to mid-term, there would be no impetus for them to continue keeping rates low which was intended to encourage US businesses to borrow for investment and expansion, creating jobs in the process. The Fed’s move to increase rates was not an unexpected one. However, what some economists did not anticipate was Yellen’s indication of a further three more hikes in 2017 where only two were expected. The main reason for the rates increase mentioned in Yellen’s announcement was that inflation expectations have increased “considerably” due to the moderate pace of expansion from economic activities. A common policy tool that central banks will adjust levers on to keep inflation fears in check is increasing benchmark interest rates. By gradually increasing rates, central banks attempt to slow down inflation and prevent over heating of the economy. As the world’s biggest economy and Singapore’s third largest trading partner in 2015, how will the Fed rates hike affect SMEs in Singapore? And how should small businesses react to these impacts? The most obvious and direct impact US rates hike would have on local SMEs would be an expected increase in costs of borrowing. As Sibor rate is closely correlated with the movement in US interest rates, it does not take an economics professor to deduce higher business loan interest rates locally. For SMEs whom are servicing commercial and industrial property loans for their business premises, they might find their mortgage instalments increasing from 2017. Most companies’ property loans are variable rates package tied to bank’s board rates or Sibor rates as reference rates. These variable rates packages would have served the companies well from 2008 to 2014 as interest rates remain subdued at historical lows. If interest rates begin to “normalize”, companies might see their property loan instalments spike up significantly in the near future. In perspective, the Sibor rate prior to the 2008 global financial crisis from 2000 to 2007 was averagely at 2.01%. Compared to the average Sibor rate of 0.61% from 2008 to 2015, current Sibor rates potentially have room to increase more than 300% with reversion back to the mean. In view of the expected increase in property loan interest, SMEs whom are still servicing property loans can explore fixed rates property loan packages when their current property loan is out of the current financier’s lock in period. Although banks will generally place a premium on fixed rates packages which is priced higher than variable rates, SMEs might consider refinancing their property loans to fixed rates to hedge against rates volatility and uncertain times ahead. A fixed monthly instalment with assured rates will enable the SME owner to plan and manage cash flow ahead. Receiving letters from the bank informing of property loan instalment increase every quarter will only add to uncertainty. Apart from property loans, unsecured business loan interest rates might trend upwards as well. With increase in interest rates, SMEs face a double whammy of higher financing costs amidst a current protracted economic slowdown. SMEs are already experiencing signs of higher interest, tightened access to credit and higher collateral required from the banks. In a recent 2016 SME Development Survey, more SMEs are expressing concern on higher costs of financing. Facing higher business loan interest rates and restrictive access to financing, SMEs can instead tap on other non-mainstream ways to access financing including crowd funding and government aided financing schemes. Alternatively, SMEs can make direct comparisons through business loan comparison portals to source for the most optimized loan options available. The startup scene is Singapore has been heating up in recent years. VC (venture capital) investments in Singapore exceeded $1B in 2014. Between 2012 to 2015, Singapore moved up seven places to 10th in an international report ranking startup ecosystems. From January to May 2016, Singapore attracted some US$1.15B in VC investments, the highest amount from a South-east Asian country. Picture credit: Singapore Business Review. 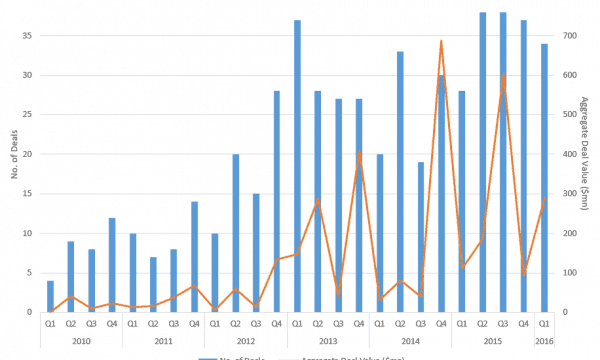 2015 Singapore VC funding. The impending interest rates hike however could slow down the growth of VC funding in the region. Traditional brick and mortar SMEs rely on business loans as main source of financing while startups typically raise financing via VCs. They should be slightly more insulated against interest rates hike but the ripple effect will play a factor in the VC fraternity as well. It’s no coincidence that most of the billion dollar technology firms in recent history like Uber and Snapchat existed only after the 2008 financial crisis where benchmark interest rates were at almost zero. In the low interest, low yield environment from 2008-2015, technology startups attract hot money like bees to honey. Startups have the potential to grow fast with a prospective high yield exit and are an attractive option in an environment where attractive yield finds are barren. However, with rates increasing higher, speculative hot money flowing into startups will likely slow down. Investors might also channel funds into fixed income or dividend paying equities which offers a more attractive alternative to riskier startup bets. This will all mean that SME startups that have no problem raising multiple series of funding previously during the boom years might see capital liquidity drying up. To deal with this potential market correction, startups can try to cut non-core expenses, turn cash flow positive in a shorter time or raise funds at lower valuations. Another alternative to VC money is seeking funding through startup grants from the government such as the ACE startup grant or IMDA. Ultimately, there is no stopping the technology revolution worldwide that is at full momentum now. Startups that can demonstrate the potential to deliver a viable product with means to scale substantially will find no lack of funding suitors. With Donald Trump’s electoral victory for the US Presidency, the US dollar began appreciating against the Singapore dollar and most Asian currencies. Pre-election, the exchange rate between USD to SGD was 1.39. This went up sharply to 1.41 post-election. 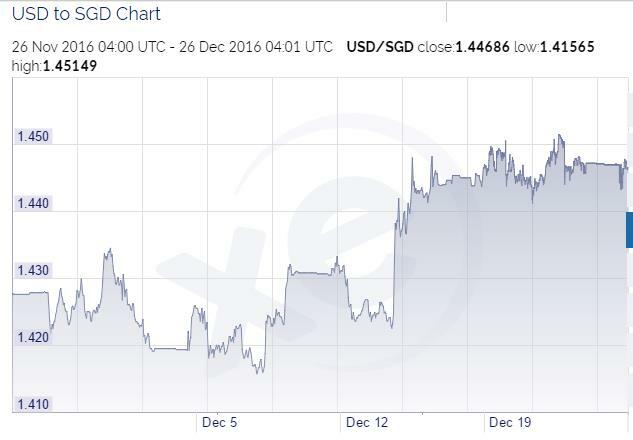 After the Fed rates hike announcement on 14th December, the USD spiked further up and at the time of writing (26 December 2016), USD/SGD is at 1.44. Both Trump’s election victory and the Fed rates hike played a heavy hand on USD’s sharp appreciation in November to December 2016. Trump has indicated that he’s open to large scale infrastructural projects and increase government spending within the US. The market’s expectations on Tump’s fiscal policies and higher interest on USD will attract more foreign funds to the US. This resulted in a natural appreciation of the USD and indirectly, capital flight away from Asian emerging markets. With a weaker Singapore dollar as a result of the appreciating USD, local exporters can find some relief from the current economic slowdown. Our exports will become more competitive and manufacturing activities might see some tailwinds. Inversely, for the smaller number of SMEs whom are net importers of goods priced in USD, the depreciating SGD would be negative for trade. The adverse effects of USD’s appreciation would be negated for these companies however, if they are selling their end products overseas also in USD, forming a natural currency hedge. But for SMEs whom import in USD and sells locally in SGD or overseas in other currencies, the stronger USD might affect gross margins and profitability as it cost more per unit of purchase now. For businesses that might be affected by such foreign exchange movements, it is best to hedge against their forex exposure to minimize volatility. Most banks will provide FX (forex) line for companies with trade financing (LC/TR) credit lines to hedge against cross currency exposure. Companies whom buy and sell in different currencies can utilize the FX line to purchase forward or spot contracts to hedge against their foreign currency purchases. Alternatively, non-bank service providers such as Western Union can also offer FX hedging solutions. SMEs that are narrowly focused and reliant on the domestic sector might experience protracted slowdown in their revenue figures following the Fed rates hike. Singapore’s economy is already facing stresses due to external events such as China’s growth deceleration and internal restructuring. An increase in domestic interest rates will have an indirect impact on local retailers and F&B players in the mid to high end segment. When the banks move to increase interest rates, property loans which form the largest component of household debt will see an increase in monthly mortgage servicing. With a higher property loan instalment, households will have lower disposable income at the end of the month and discretionary purchases might drop. Local retailers and F&B restaurateurs might see a further drop in revenue and lower demand of consumption could lead to a contraction in domestic economy activity. SMEs in the construction trade will likely be affected as well by the rates hike. With higher SME loan borrowing costs, local property purchases which are usually leveraged with mortgages might go south. Property investors buying for rental yield might also defer their investment decisions as property yields are compressed with higher interest. These investors might divert their resources instead to fixed income bonds or securities as bond prices typically have an inverse relationship with interest. With the real estate industry and developers in a doldrums, SMEs in the construction industry further down the supply chain such as sub-contractors and building materials distributors will be negatively impacted. For SMEs in these segments, all is not doom and gloom. During lean times, SMEs can take this opportunity to further improve their productivity and undertake simple cost rationalization exercises. Small retailers could move part of their business onto e-commerce platforms or create their own web stores to reach out to more consumers. Available off-the-shelf technologies such as RFID and inventory management software could also help identify product trends and prevent overstock. F&B restaurant owners can tie up with food delivery app players such as Foodpanda and Deliveroo to reach out to a bigger consumer market. Certain manual processes in the kitchen could be eliminated with investment in automated kitchen equipment. Self –ordering menu software or apps could also reduce the number of waiting staff and shorten ordering to kitchen turnaround time. Similarly, SMEs in the construction industry could also relook into their current workflow and think up of new process that could reduce reliance of manual manpower. Prefabrication is one area where the authorities are investing much resource on for the local construction industry. Certain tools and equipment could be deployed to reduce manual labour. In conclusion, the rates hike from the US is not an entirely negative event for Singapore SMEs. By moving benchmark interest up, the US is confident its economy has moved on from the malaise of 2008’s financial crisis. If the world’s biggest economy is recovering, there would be higher aggregate demand for Asia’s goods and services. Should the US economy could take on the key engine driver role for the global economy’s recovery which remains sluggish now, Singapore’s economy might benefit from the spill over effects. There are still opportunities in a slowdown for nimble SMEs to take advantage of. Also, it remains uncertain if the Fed would phase in the three rates hikes planned for in 2017. This is especially so if another major external event such as a debt crisis in China’s economy occurs or if inflation falls short of the Fed’s target of 2%.